Apply generously to seal cracks and gaps. Professional quality Acoustical Caulk Sealant, also referred to as noiseproofing sealant, 28 oz tube, is designed to dampen sound between room surfaces. Seal cracks between walls, ceiling, and floors to minimize sound leaks. Acoustical Caulk is highly flexible with exceptional aging characteristics - will not dry out nor crack with age. 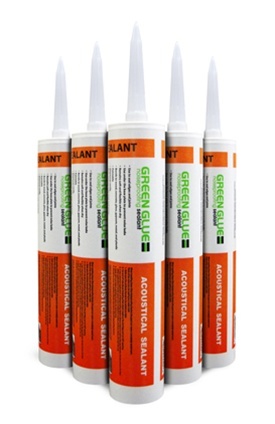 There are 12 Acoustical Caulk Sealant tubes per case. Acoustical Caulk Sealant can be easily applied using any standard, quart-sized caulking gun applicator. For maximum performance, apply a 1/4" bead of Acoustical Caulk Sealant along the edges and joints between floors and walls as well as between walls and ceiling. Once dry, Acoustical Caulk Sealant can be painted. Estimated yield, at a 1/4" bead, is 60 lineal feet (LFT) per tube or 720 LFT per case. 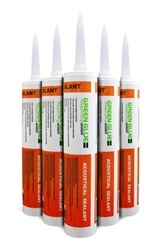 Acoustical Caulk Sealant exceeds LEED green building requirements, is low V.O.C and nearly odorless. Cleans easily, while still wet, with soap and water.